Usually i'm missing parts, i need to order a bunch of resistors, capacitors, etc. The VCAs, the ADSRs and the mixer boards also need them, so i'm writing a list. Still, i need to build a PSU, with a +5V output for a midibox MIDI2CV unit. Sooo much work to do! Awesome! 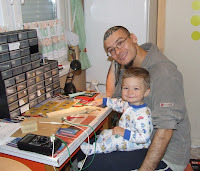 Pass your passion to your child and we'll keep the DIY Synth going into the next generation! Thanks YpsiSynth! I'm following your blog, to see your synths, they give me much inspiration, and mood, to continue my own modular.